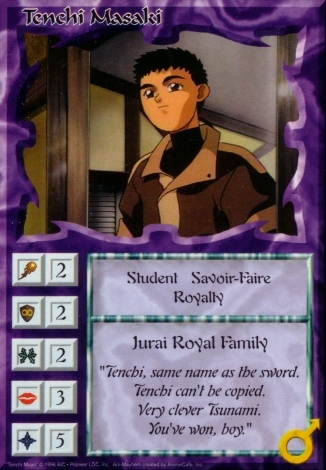 Tenchi is one of my favorite Characters in the game. Now he might not be that strong at first glance, with only 2 on three of his stats. But he has the best defensive Enhancement in the game, Wings Of The Light Hawk. It may cost a lot of Energy, a whopping 6 to be exact, but the ability it gives is well worth it. It gives + 4 to his defense, putting him at a good solid Defense of 6. Its second ability is where it shines. Every Combat you can stop 2 attacks that would get past his defense. Now that you have Defense set up, it would be time to increase his Attack, and why not add more to his Defense while you're at it. Now they're plenty of cards that increase stats but I like storyline cards. The next card in his arsenal would be the Juraian Ultra Battle suit. This ups his Attack and Defense by 2, as well as adding 1 to his Movement. Now a 4 Attack and 8 Defense character is good for defense purposes but you want him to be able to hit stuff. 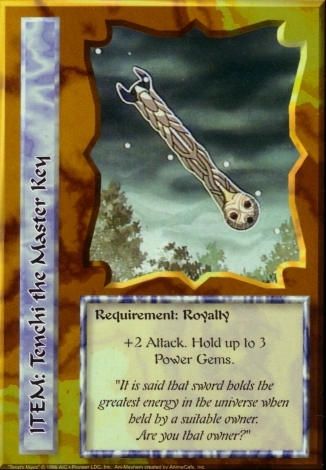 For me, again story wise, this would be the Item Tenchi the Master Key. 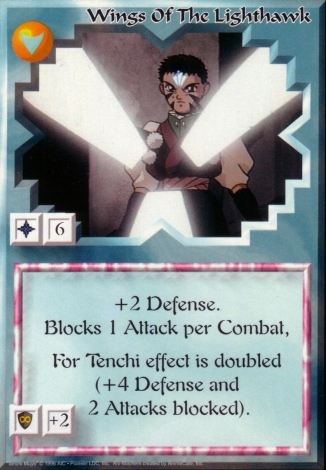 This card gives him 2 more Attack as well as gives him access to 3 Power Gems, which he needs for the Energy to use the above Enhancements. With all the above, you're looking at a 6 Attack, 8 Defense, 3 Movement, 3 Charm, and 0 Energy powerhouse that can stop 2 attacks per Combat. Now I don't like having 0 Energy on any Character so I combo with cards like Planet Jurai, Kami, and Spirits to keep his Energy up. 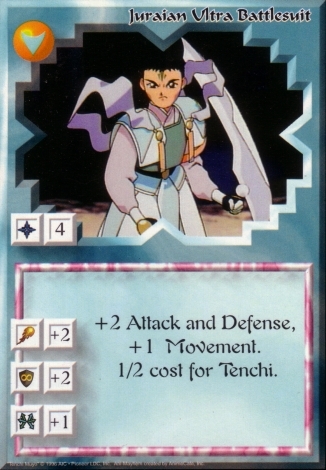 A great card to combo with Tenchi is Gohan is Angry..., adding 4 to his Attack is a great power boost when needed, and you can use it no matter how high you raise his Attack due to it only needing his base Attack to be less than 3. Now you can choose to add more things to him like a battle suit that would increase his stats by a good amount, but I like playing the way they are in the anime. Any questions or comments feel free to e-mail me.